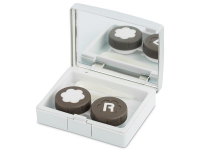 Each of our handy lens kits comes with a built-in mirror to help you easily insert and remove your lenses on the go. Kits also contain a pair of tweezers and a lens case, so you'll never be without your contact lens essentials. The box's sleek, silver finish is rich, finishing touch.